Despite being on the market less than six months, Apple’s iPhone has moved into the No. 2 spot among smart phones in the U.S., surpassing Windows Mobile handsets from Microsoft. In an analysis from Canalys researchers, it is estimated that the iPhone had 28 percent of the U.S. smart phone market during the fourth quarter. Research In Motion, makers of the Blackberry line of phones, still has the largest share at 41 percent. Nokia, the world’s No. 1 cell phone manufacturer, sold 52.9 percent of the smart phones worldwide, dominating everywhere but the U.S. market. 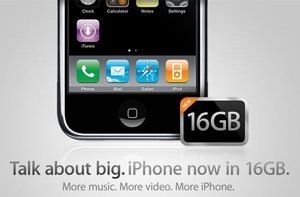 Worldwide, RIM is second with 11.4 percent (up 121 percent over the same quarter in 2006), and Apple is third despite the phone’s limited availability with 6.5 percent, surpassing troubled Motorola. Version 2 of the iPhone, which just received more storage capacity this week, is expected sometime this spring or early summer, although the rumor mill has yet to crank up in earnest over a new phone. The iPhone may get a bump in the market when Apple releases its software developer kit later this month, making it seem like the iPhone has new and exciting features once third-party developers begin delivering applications.